Make a new Champagne Cocktails using Starburst candy! Add your favorite Starburst flavor to any sparkling wine or cider and allow to dissolve for beautiful color and fun flavor! 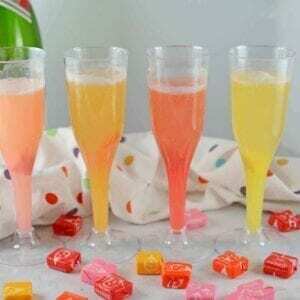 Place your favorite flavor of Starburst in a champagne fluke or other glass, pour sparkling wine or cider over. Stir lightly and wait 4-5 minutes for color to develop. If you've tried this recipe, let us know how it was!